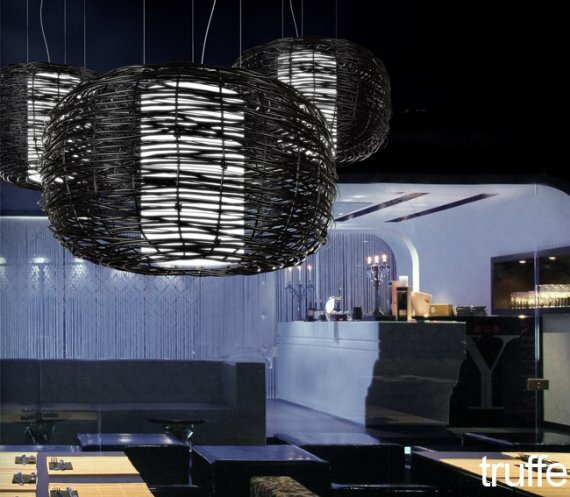 Australian lighting company Yellow Goat Design has some new pieces out today. 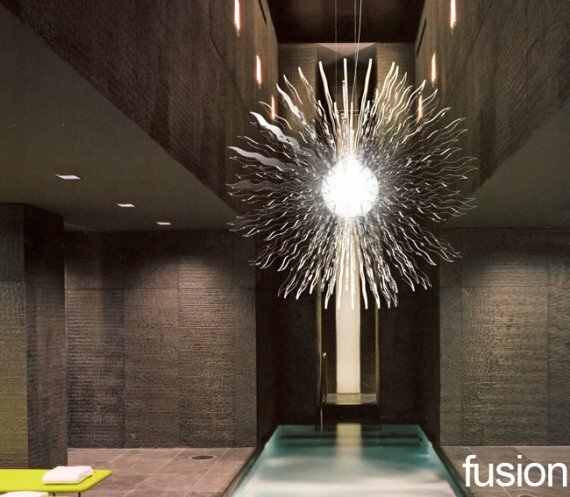 Fusion features a 10mm thick clear acrylic elements laser cut with shiny edges into a sun burst form all gathered around a 250mm diameter opal pearl lit by a 38 watt compact fluoro. 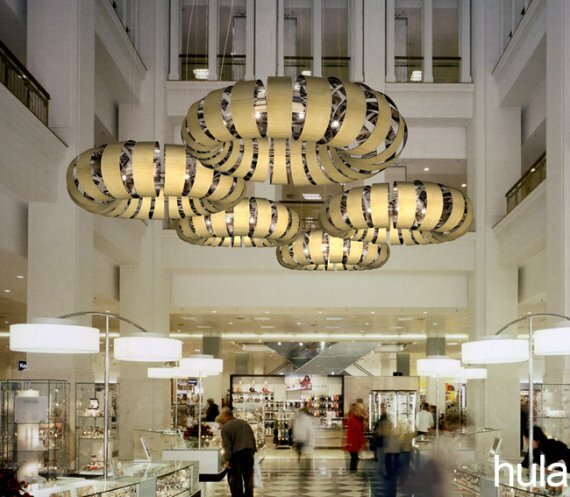 Could also be built with coloured or frosted acrylic or even in metal elements. Dimensions 1100mm diameter. Hoops around a tube within a donut, is there an easier way to describe this magnificent piece? Each hoop is around 400mm diameter and around 200mm wide. Shown is a birch veneer outside with mirror lining inside. Between each hoop is a 20 watt x 12V Bi Pin continually reflected throughout the entire perimeter. The main structural element is a mirror polished aluminium tube 76x4mm bent into a donut shape. Dimensions; generally around 1400-1600mm diameter. Overall 300-500mm diameter hoops. Design: Conrad Johnsson. …or 100 drop pendant or 150 drop pendant or whatever size you require. 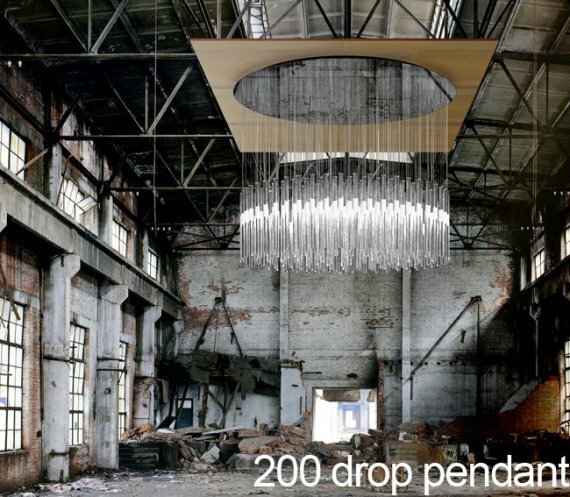 The unit pictured is 2400mm in diameter with 200 drops as the name implies. Each drop can vary in length and each drop consists of a 600mm long x 40mm diameter crystal glass tube with a frosted band around the outside (optional) and a 10 watt 12V long-life bi-pin inside. Glamour. A slightly sophisticated take on the standard wicker basket. This piece is loose woven using 6mm thick natural or artificial wicker which is painted in a colour to suit you. A polycarbonate and acrylic diffuser is positioned in the centre. Dimensions are 1000mm diameter x 700mm tall. lighting is 20 watt compact fluoros or dimmable PL fluoro. When french architect Hervé Langlaise presented his stainless steel bubbles screen at the Dubai hotel Show, we decided to take it on for Australia. 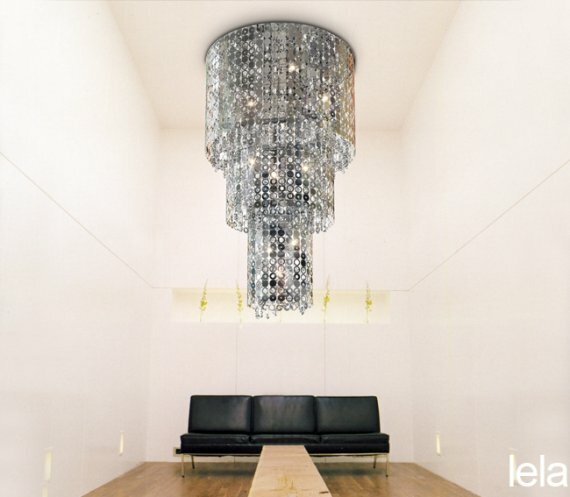 This gorgeous piece is our first attempt at building a very cool old style chandelier complete with crystals, but giving it quite a cutting edge look. Dimensions 1500mm tall x 800mm diameter. This piece could easily be described as ethereal, delicate, exquisite but my favorite word for it is simply ‘gorgeous’. 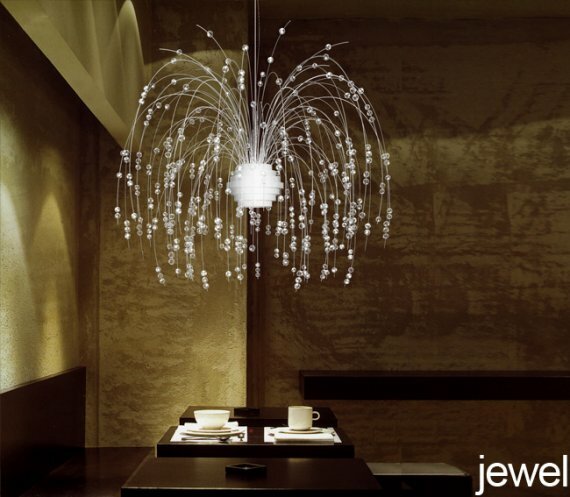 A cascade of Swarovski Strass jewels on thin stainless steel wires emanating from a beautiful deco style frosted acrylic center lit by an opal compact fluoro. Outstanding. Design: Samantha Brown.